The growth in greenhouse gases in the atmosphere because of anthropogenic activities is also expected to be the most important factor forcing climate to change during the 21st century. Within the atmosphere there are naturally occurring greenhouse gases, which trap some of the outgoing infrared radiation emitted by the earth and the atmosphere. The principal greenhouse gas is water vapour, but also carbon dioxide (CO2), ozone (O3), methane (CH4) and nitrous oxides (N2O), together with clouds, keeps the Earth's surface and troposphere 33 °C warmer than it would otherwise be. This is the natural greenhouse effect. Changes in the concentrations of these greenhouse gases will change the efficiency with which the Earth cools to space. The atmosphere absorbs more of the outgoing terrestrial radiation from the surface when concentrations of greenhouse gases increase. 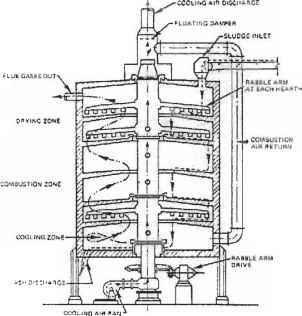 This is emitted at higher altitudes and colder temperatures and results in a positive radiative forcing which tends to warm the lower atmosphere and Earth's surface. This is the enhanced greenhouse effect - an enhancement of an effect that has operated in the Earth's atmosphere for billions of years due to naturally occurring greenhouse gases e.g. Salinger et al., (2000) IPCC, (2001a). The natural concentration ranged from about 190 to 280 parts per million (ppm). When CO2 concentrations were low, so too were temperatures, and when CO2 concentrations were high, it was warmer. Greenhouse gases in the atmosphere are expected effectively double or quadruple by 2100. In order to make projections of future climate, models incorporate past, as well as future emissions of greenhouse gases and aerosols. The IPCC has modeled climate using seven main scenarios of greenhouse gas and other human-related emissions, based on the IPCC Special Report on Emissions Scenarios (SRES) (IPCC, 2000). 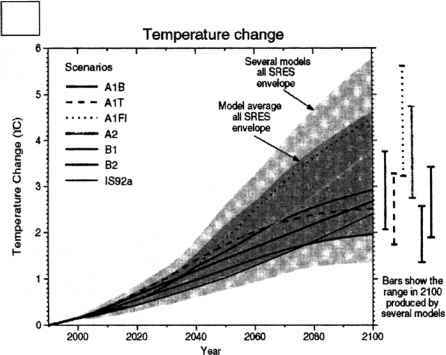 From these a full range of 42 SRES scenarios have been produced, based on a number of climate models. The pattern of temperature increase from these is shown in Figure 10. Figure 10. Estimated anthropogenic global temperature change for 1990-2100 for the seven illustrative SRES scenarios using a simple climate model tuned to seven atmosphere-ocean general climate models. The dark shading represents the full envelope of the full set of 42 SRES scenarios. The bars show the range of model results in 2,100 for the six climate model tunings. the last 10,000 yr - and certainly during the period of settled agriculture and forestry. The global model simulations indicate that nearly all land areas will warm more rapidly than the global average, especially those located at northern high latitudes (IPCC, 2001a). Most notable of these is the warming in the northern regions of North America, and northern and central Asia. In contrast, the projected warming is less than the global mean change in southeast Asia in summer and in southern South America in winter. More crucial to agriculture and forestry, especially in areas at low latitudes where activities are rainfed, are the likely changes in precipitation. Global model simulations (IPCC, 2001a) indicate that by the second half of the 21st century, it is likely that precipitation will have increased over northern mid- to high-latitudes. At low latitudes both increases and decreases have been projected over land areas. Trends in these regions will be critical. *For other areas, there are either insufficient data or conflicting analyses. **Past and future changes in tropical cyclone location and frequency are uncertain. For more details see IPCC (2001a). Figure 11. 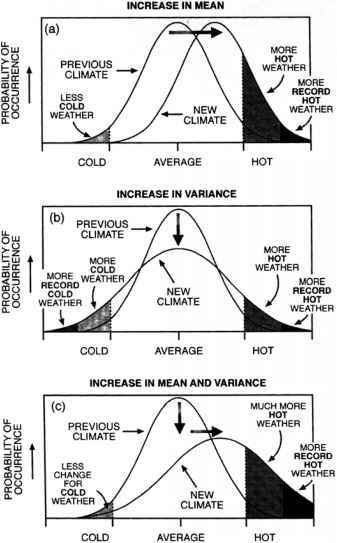 Schematic theory showing the effect on extreme temperatures when (a) the mean temperature increases, (b) the variance increases, and (c) when both the mean and variance increase for a normal distribution of temperature. shows that shifts in both means and variance can have a profound effect on the frequency of extremes.